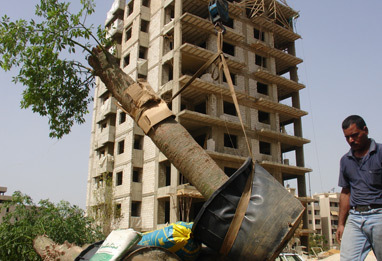 Whether for a residence, a rooftop, a casino, an urban planter or a penthouse suite, once the different materials and constructions to be used in the final stage are ordered and the proper choice of plants is made under the supervision of the Agricultural Engineer based on the use, functionality, climate, and esthetics, our construction services team rolls out the big equipment to grade the land to begin the installation of the irrigation systems required. Both tree and garden services are given dedicated attention from our Site Engineer and our Foremen. ROOTS has invested heavily in the latest construction equipment to assist in the implementation of all sizes of jobs. We have at our disposal equipment such as truck-mounted cranes, telescopic cranes, front loaders, tractors, bobcats, JCB's, pickups and various sized trucks. At ROOTS, we dedicate ourselves to on-time completion of the construction services per our agreed-upon delivery dates. Once we have completed a way to nurture the plants, they are planted according to the design specifications and client feedback to assure complete quality in the execution of the plan.